Get a taste of Peru and its rich Inca culture on this custom tour that can easily be add-ed as an extension following a Galapagos Islands cruise or Patagonia adventure. Dis-cover the colorful market towns and ancient Inca settlements of the magnificent Sacred Valley and witness the jewel in it's crown - Machu Picchu. Then spend time exploring the charismatic streets of Cusco before returning to the pulsing capital Lima. NOTE: The below is a sample itinerary for a popular extension option to see the Sacred Valley, Cusco and Machu Picchu. Many of our guests, whether in the Galapagos or in Patagonia, will add this itinerary to their trip or custom build one with us. Please contact us with any questions and our Peru specialists will be eager to help! Arrive into Peru where you’ll be greeted by one of our friendly representatives and transferred to your Lima hotel for the night. After checking in, you’ll be briefed on the unforgettable Peru adventure that awaits and given a handy “travel kit” including all your travel documents, tickets, hotel information and itineraries. After breakfast at the hotel, you’ll be transferred to the Lima Airport for your 90-minute flight over the snow-capped Andes to the charming city of Cusco. You’ll travel from Cusco to the colorful market town of Pisac where you can shop for tradi-tional Peruvian handicrafts and souvenirs, with the main square igniting each Sunday when traders come from across the region to sell their wares. Then continue to the town of Urubamba where we’ll stop for lunch and a lively Peruvian Paso horse show. It’s then on to the city of Ollantaytambo, which is unique in its Inca urban planning and immense stone structures. Wander amidst the temples, storehouses and agricul-tural terraces that exhibit ancient Incan craftsmanship before continuing on to your hotel in the Sacred Valley. Wake early for your train journey from Ollantaytambo to KM 104 where you will begin a four-hour trek to the archaeological sites of Chachabamba (2150m/7052ft) and Wiñaywayna (2650m/8692f) whose magnificent Inca terraces cascade down the hillside. Then continue on to Inti Punku or “Gateway of the Sun” where you can soak up the views of the Machu Picchu Sanctuary before a shuttle bus transports you to the town of Aguas Calientes where you’ll spend the night. From Ollantaytambo, you’ll board a train to the town of Aguas Calientes, which nes-tles at the base of Machu Picchu, then jump aboard a bus for the 20-minute journey to this UNESCO World Heritage Site. Machu Picchu was uncovered by Hiram Bingham in 1911 and boasts a breathtaking setting between two soaring mountains - Machu Picchu and Huayna Picchu. You’ll be led on a guided tour to discover its ancient ruins and learn about the unique Incan craftsmanship, with plenty of time to explore at your leisure. Then board the bus that will take you back down to Aguas Calientes where you can reflect on the day in the comfort of your hotel. If you spent the previous day trekking, now is your opportunity to explore the ancient Inca citadel of Machu Picchu, with a 20-minute shuttle ride transporting you from Aguas Calientes to this spectacular UNESCO World Heritage Site. In addition to a guided tour of its ancient ruins, your entrance includes access to the mountain of Huayna Picchu, which offers magnificent views of Machu Picchu. Enjoy a buffet lunch at the Sanctuary Lodge before boarding your first class train car-riage for the journey to Poroy and a private transfer to your hotel in Cusco. After breakfast at the hotel, you’ll embark on a tour through the historic streets of Cusco where Spanish colonial monuments have been built atop ancient Inca founda-tions. Wander through the Main Square that was known during Inca times as Huacaypata (“Warrior’s Square”) and visit the magnificent Cusco Cathedral that is noted for its choir cloisters, pulpit and beautifully engraved altar. Then explore the Church and Convent of Santo Domingo that was built on the site of the Koricancha temple that was reportedly plated with sheets of gold and where ancient Incas used to worship the sun. Head to the outskirts of the city center to the spectacular ruins of Sacsayhuamán, which was originally built by the Killke culture around 1,100 AD. It was later ex-panded and added to by the Inca, with immense dry stone walls constructed without the use of mortar. After lunch at one of Cusco’s best restaurants, you’ll be transferred to the Cusco Airport for your flight to Lima. Spend the day at your leisure in Lima (or we can organize an optional guided tour for you), returning to the Lima Airport in time for your international flight or onward travel in South America. Departures: Trips are custom-priced based on dates, availability, number of travelers, level of accommodations and specific activities. Pricing listed is based on a 6 day tour for 2 guests sharing Tourist Superior accomodations. Please contact for specific pricing. Most travelers do not need visas; travelers of most nationalities are granted a 90 day tourist visa. All nationalities, however, need a tourist or embarkation card (tarjeta de embarque) to enter Peru, issued at the customs or on the plane before landing in Lima. Are there any special events in Peru during the year? February Carnival - Celebrated most of the month prior to Lent throughout the whole country. March/April Easter (Holy Week) - Fantastic parades all over Peru. 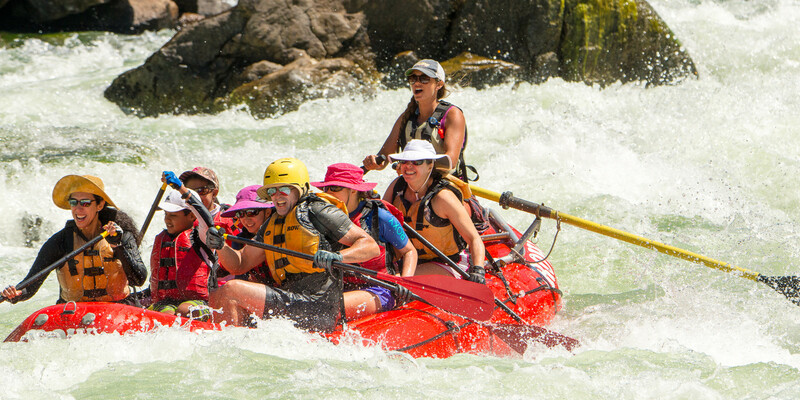 ROW Adventures like the one in Cusco! June 24 Inti Raymi - Cusco's main Inca Festival of the Sun. A great time to tour the Inca Trail and Machu Picchu. August 13 - 19 Arequipa Week - Parades, firework displays, plenty of folklore, dancing, and craft markets. September End of the month Festival of Spring - Involves dancing, particularly the local Marinera dance. October 18 - 28 Lord of Miracles - Festival featuring large and solemn processions. Difficult to answer, this is really a question of personal preference. The busy season is June to August and it's also the driest part of the year in Machu Picchu. If you don't mind being a little wet while avoiding a heavy flow of visitors, Machu Picchu in December and January is absolutely perfect for you. It's important to remember that tours to Machu Picchu happen all year round but the Inca Trail is closed in February each year. The current Peruvian currency, the Nuevo Sol - whose symbol is S/. Simply called a "Sol" . In Lima and Cuzco (and most other cities), Euros are as acceptable as US dollars for changing into soles.